Free Knitting & Crochet Project Tutorials for you! Categories of yarn, gauge ranges, and recommended needle and hook sizes. Learn what yarns are used for what projects. Have you seen those fun "ruffle" yarns in our stores and on our web site? Here's how it works! 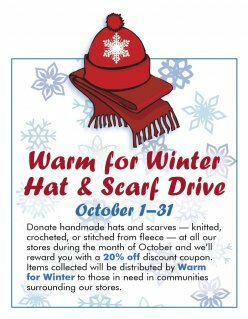 Leah designed this warm ribbed hat for our Warm for Winter October Hat & Scarf Drive. Quick, easy and cozy! The simplest of scarves made up in a fabulous yarn! Learn how or teach a friend. Try different yarns and you'll be amazed at what you can do! Quick, easy and fun to take along for a weekend drive! Makes a great gift or a fun way to freshen up your kitchen or bath. The hottest fiber art around! Here's the scoop on what you'll need to get started. To shop for supplies, click here . Designed by Anna-Beth of our Northgate store, this simple little bowl is felted and much firmer than when it’s just a knit. The size will depend upon your knitting tension, choice of yarns, and how much you felt it. Choose any 2 shades of the softer Scrubby Cotton and crochet washcloths. Add a touch of seashore whimsy to your bothroom with this crocheted starfish scrubby. The fabulous First Pitch Poncho designed by Leah Rosen of our Northgate store and worn by Jackie McInnes as she threw out the first yarn covered pitch to the Mariner Moose at the First Annual Mariners Stitch 'n Pitch Night presented by Pacific Fabrics & Crafts. A bit of the tropics to start your spring brightly! A little yarn, a crochet hook and off you go. So easy, you'll want to play with lots of yarns and colors and make several. Fun for kids, too! Here's a quick scarf you can hook up in no time! Keep your head warm with this easy to make basic hat.